Avoid the crowds, ditch the frenzy and win Christmas by shopping online this year. 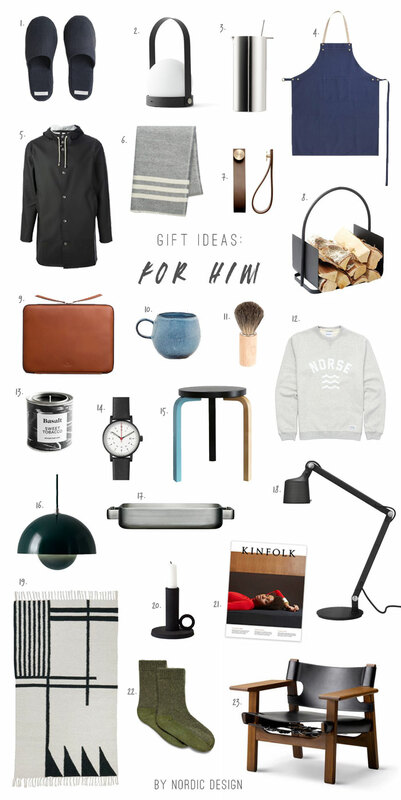 And your search for the perfect gift for the man in your life stops here! I’ve rounded up design pieces, home accessories and other lovely goodies from fab shops from around the web, for any budget and style. Visit my Christmas section for more inspiration, as well as my gift ideas from my own wish list. What is item number 8? Seems like the link isn’t working and name is missing. Thanks for noticing the mistake! I am really sorry, it seems I misplaced the information about this product and I can’t retrieve the source… I’ll keep you posted and modify the article as soon as I figure out where this firewood carrier is from.